Home | Developing A Presentation/Speech | Speakers and Wannabes: Time to Plan. . .
Those 2015 New Year Resolutions! 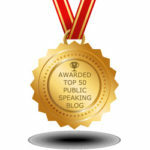 If you’re reading this blog you probably have an interest in Public Speaking and Presentation Skills. Good! No one ever challenges that statement. Why would they! You’re either now taking and making those opportunities, or you Wannabe doing it! 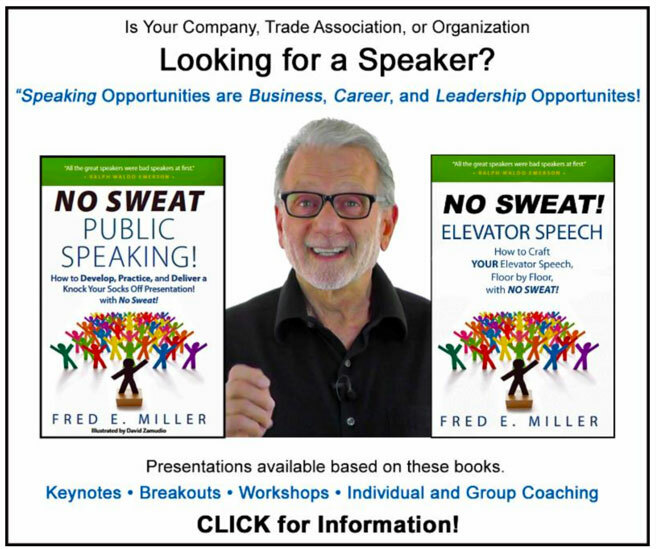 If you’re already speaking where you work, associations, and chambers – Great! 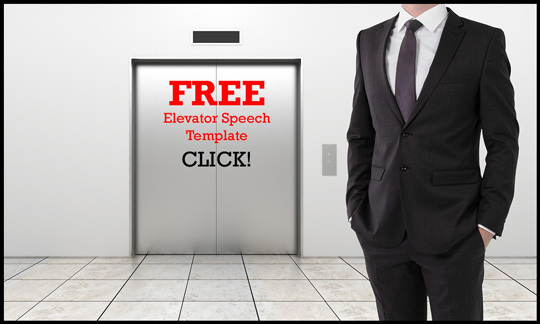 Your goal in 2015 is to deliver more and better presentations. Start contacting chambers, service clubs, and others who regularly have guest speakers. You’ll also want to put out feelers for companies that have ‘Lunch and Learns’ or bring in speakers for Continuing Education for their employees. Be certain to have a “One Sheet” that can be emailed to them. This is a one page informational document. 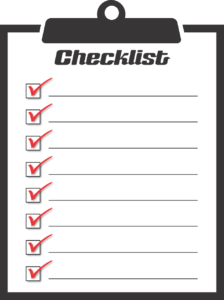 It should list your topics, give a brief description of each, and have your contact information. Having your “Expert Credentials” included will help land opportunities. Why should they choose you as their featured speaker? Send it as a PDF and include links to your website, youtube channel, LinkedIn Profile, etc. Follow up regularly after the initial contact. 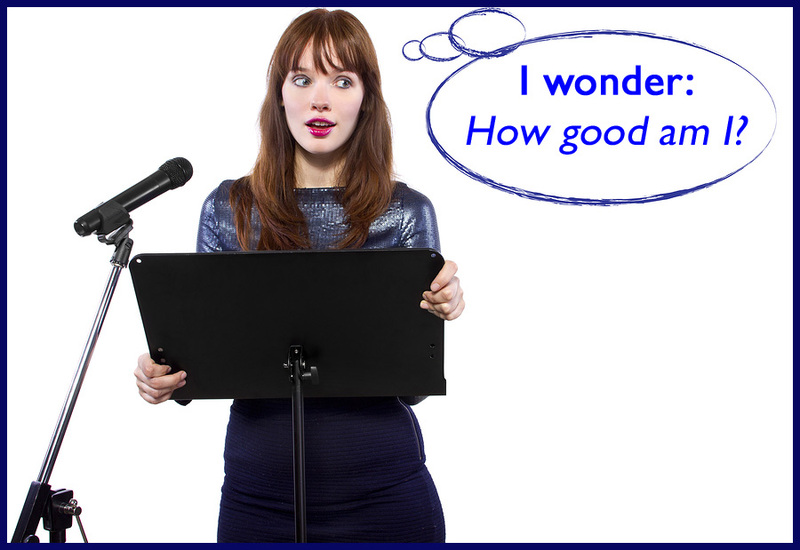 Getting speaking gigs is a process, not an event! Let them know you may be available if the scheduled person, at the last minute, can’t make good on their commitment. Network with others who make presentations. You can refer them, and the favor will be returned. The event planner, program chairperson, or whoever gave you the “Speaking Opportunity.” Probably communicates with others who have the same role and responsibility in their organizations. Ask them for a testimonial and referrals. Improve the presentations you currently do. All presentations can be tweaked and made better. Stories in the body of your talk that reinforce the points you’re making. Listen to audio recordings and watch videos of your previous talks. It can be tough to do this, but the upside outweighs the downside. 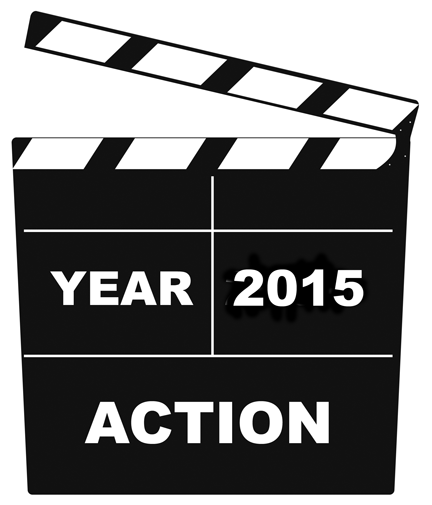 If you’re not recording yourself, make it a goal for 2015! 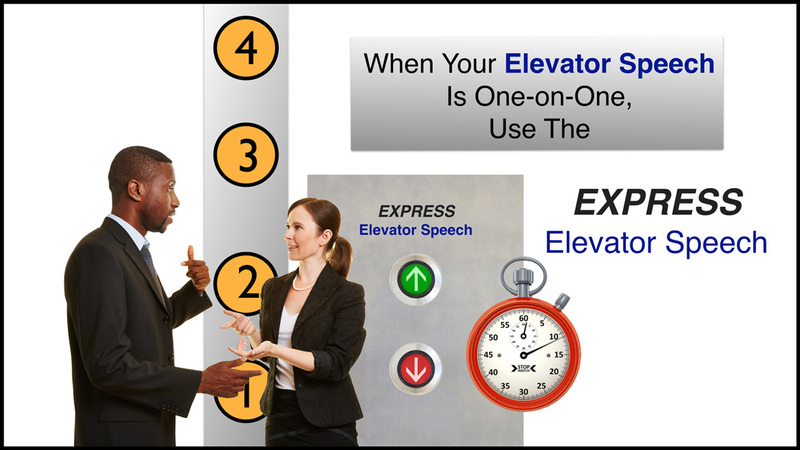 Attend events where seasoned and novice speakers give speeches. You’ll learn by critically noting the good and bad elements of their talks. What was the content of their Introduction as delivered by the master of ceremonies? In their Opening, what, if anything, grabbed your attention? What was their message and how was it delivered? Did they use stories in the body of their talk to reinforce points of their speech? What did you discern from their verbal and non-verbal communication? If they used slides, what was on them and did it add, or detract, from the subject matter? Was everything in sync with their core message? How, and when, did they handle questions? The videos are about “Ideas Worth Spreading.” You’ll learn many things and observe some of the ‘Best of the Best’ presenters. 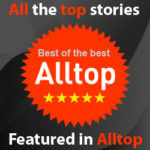 Read books and listen to audio recordings about your topics and about presentation skills. Hire a Personal Presentation Coach. The topic you speak about probably has several modules. For instance, most of my presentations have a module about the Fear of Public Speaking; Why we have it and Nuggets to Lessen it. I developed a separate presentation on just that topic. You can do the same! Work on a presentation having nothing to do with your core topic. Getting out of your comfort zone will make it larger! It might be a hobby, volunteer activity, or other area of interest in your life. Example: I’ve developed, and now conduct a seminar on Overseas Travel: Things to do before leaving home, and tips for traveling abroad. Personal experience, research, and class participation have combined to make each successive class better! What activity do you enjoy others could benefit from learning? Work on your Personal Branding and building your EXPERT Stool. Those responsible for bringing in speakers want to have EXPERTS in front of their audiences. Promoting those activities via social media, email marketing, and other technologies. With print-on-demand and ebooks, publishing is easier than ever. We perceive authors as EXPERTS! Having a book adds to your credibility and makes it easier to land those Speaking Opportunities. It’s best, for your first “Signature Presentation,” to pick a topic you know well, very well. A presentation has two components, Content and Delivery. If you really ‘know your stuff,’ you can focus on Delivery of that message. One stressor at a time is easier to handle, isn’t it! Toastmasters in an International Organization with over 313,000 members in 126 countries. They are a world leader in communication and leadership development. Start blogging about topics you’re considering talking about. Regularly writing articles forces you to think, research, and learn about potential subjects for presentations. You’ll stick with some subjects and eliminate others. Include a podcast of each post. This is a great way to edit your content and improve your speaking. You’ll catch writing errors and hear ways to improve your verbal delivery of the post. Written Post + Audio Post = Better Writing and Better Speaking! Start working on those 2015 Speaking Goals today! 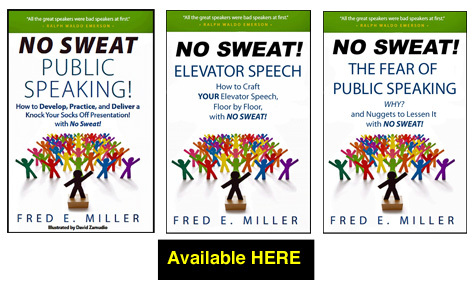 When you book that Speaking Opportunity, use the information in previous articles and I guarantee your presentation will be absolutely, positively – NO SWEAT! Want to be a better Presenter? 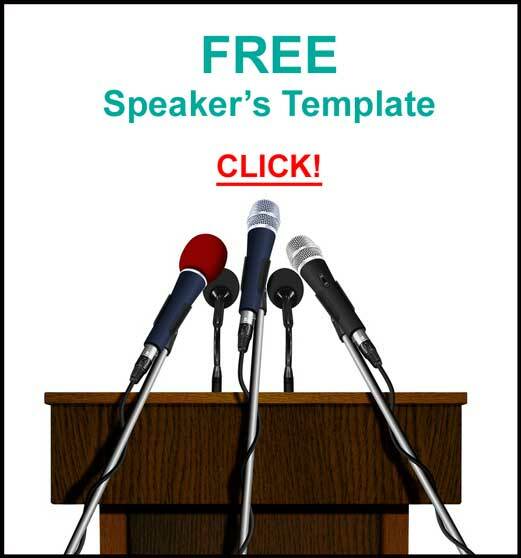 Get this FREE Speaker’s Template Here!